Sometimes it takes an outsider to remind the insiders what they’ve got. Question: When was the last time you went to the Woodruff Arts Center? Or took the Stone Mountain Scenic Railroad? When was the last time you visited the King Center or went to the World of Coke? It was probably the last time you had guests in town, wasn’t it? Elizabeth and I lived in Chicago for seven years. The only time we ever went to the top of the Sears Tower was when our families came to visit. Seven years we lived there, a quick ten minute train ride away; and we probably went there three times. That’s the essence of the lesson from Matthew this morning. There are two competing theories about where these Magi are from. The word “Magi” is a Persian word, referring to the Zoroastrian priestly class. And the three gifts – the gold, frankincense, and myrrh – never appear in Biblical literature together, but were common Persian temple sacrifices. On the other hand, the text we read from Isaiah talks about Midian and Ephah and Sheba, all regions of Arabia. The phrase “the East” in Scripture usually means “the other side of the Jordan River”. 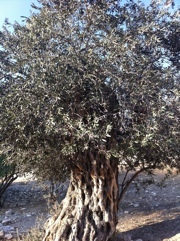 And frankincense is native to the Arabian Peninsula. Whatever the reality, whether these visitors to the Christ child are Persian or Arab, in the eyes of the Jerusalemites, they ain’t from around here. It was every bit as unimaginable then as it would be today: Persians and Arabs paying homage at the feet of a Jewish infant. “Bethlehem,” they tell him. And they even recite the text from Micah, something about this little town of Judah who will bring forth a ruler. Four hundred years they’ve been waiting for Messiah: yearning, pleading, hoping, begging, waiting. And as soon as the possibility arises that the Messiah is here, all they can do is tell Herod how to MapQuest Bethlehem. Meanwhile Herod, supposedly the protector of his people, decides that this Messiah person must be wiped out! Why would they do this? Why wouldn’t they go with the Magi, pay homage themselves, and welcome the Messiah for whom they have waited so long? I do want to give these folks the benefit of the doubt. I’m guessing that this wasn’t the first time that Herod or the religious scholars heard these claims. The “boy who cried Messiah” was probably a pretty familiar occurrence around Jerusalem. 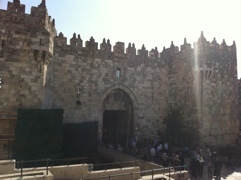 In the modern day city, in fact, there is an illness called “Jerusalem Syndrome” whereby visitors to the holy city become so overwhelmed with the emotion of being in the place that they become convinced that they are the Messiah, or Jesus returned, or the rightful heir to King David. In the ancient longing for deliverance, it is fairly likely that Messianic claims were a dime a dozen. But I don’t want to let them off the hook too easily. After all, the text lets us know that all of Jerusalem was terrified. If this kind of thing happened regularly, it’s doubtful that it would have thrown the whole city into panic. Instead, there must have been something markedly different about this time. Foreign visitors, priests of another religion, had come at the beckoning of the heavens themselves to meet the Savior of another tribe, another nation. It causes me to wonder if this has more to do with the fact that Herod and his coterie of scholars and functionaries have everything to lose. If these Magi are right, if they have read the stars correctly, then it won’t be long before Herod is replaced by the rightful heir to David’s throne. And all of the knowledge that the scholars have accrued – and the power it has brought them – it will soon become completely irrelevant. We are no longer waiting for Messiah; Messiah has come! Sometimes it takes an outsider to remind the insiders what they’ve got. But that doesn’t mean that the insiders will pay attention. What does that mean for us? Is there something for us in this lesson of the Magi who seem know the truth more readily than those who ought to grasp it? Could this be a warning for those of us inside the church to pay closer attention to what those we have considered “outsiders” have to say? We live in a radically changing culture. This is a familiar refrain in my preaching, I know. The place in society for churches like OPC is up for grabs. The days are long gone when you can simply build a church in a neighborhood and expect people to show up because you have opened the doors. And folks, we are not alone in this challenge by any means. The size of a church doesn’t matter a whole lot. The only thing a larger community gets you, it seems, is a little more time. In a way, we have been like those religion scholars sitting in Jerusalem, hanging onto the minutiae of religious life, with our own language of narthexes and intinctions and benedictions while the world outside has ceased to care what we have to offer, more eager to scan the horizon for heavenly signs that might point them to a living, breathing, yet vulnerable reality of God at work. I come to you with this not as one of the Magi, but as a fellow Pharisee who sees a world that is very unlike the world I knew as a child. I am unsure of what is to come, but I am convicted of two things: it won’t be like it was, and it will be in the hands of God. I don’t have a magic star to point to as a guiding light; but I am convinced that OPC is a unique community, one that can ride the waves of a changing world, be changed by it faithfully, and come out stronger and more committed to the ministry Christ has called us to. It has been a few years since we started using the tagline “the community is our congregation.” But the truth is that this self-identity is in the DNA of this place. For 62 years OPC has lived by this conviction, seeking to make this little corner of God’s world a better place. You do know that churches split and ultimately collapse under their own weight over things we have done without much fanfare at all. Drums? Guitars? LCD projectors? Coffee in the Sanctuary? And that leads me into what I love about this church the most: you are not people convinced that we’ve got it all figured out. We may have some glimpse of it, but we are more likely to struggle through it together, knowing we don’t know it all, but willing to try and figure it out. Especially in the world we live in, that’s a kind of Christian community that is desperately needed! And I’m also convinced that it is this collective wisdom which is going to help us read the signs in the sky as we continue our journey toward a thriving faith in a world that is, much like Jerusalem, terrified at the possibilities. We have posted a congregational survey online. And as you do, I especially invite you to read the initial letter from the Session. It gives a concise summary of our current situation and how we can find our way forward. We will also hold a town hall forum three weeks from today on January 29 immediately following worship. Above all, I invite your prayers for our church – not for our own sake, but for the sake of our calling as God’s people. At times like this, the temptation can be strong to turn inward: to treat surveys as customer service evaluations, to circle the protective wagons against “them”, whoever “they” might be. Instead, I trust that we are being nudged to keep an eye out for the Magi. May we have the wisdom to hear them! 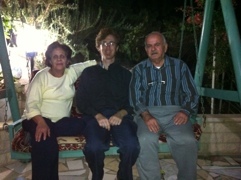 Ten years ago today, my wife Elizabeth and I were living and working in a Palestinian village in theWest Bank. This fact has colored my experience of that day in ways that continue to change me. 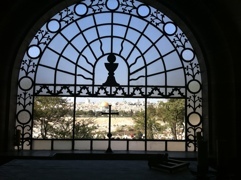 In short, we were very much at home in a place that many of my fellow countrymen now considered “behind enemy lines.” We were Western American Christians living among an Arab Palestinian Muslim majority. And yet, what we experienced was sympathy – friends dropping by to know if our family was OK; the organizing of candlelight vigils and blood drives. There was a simple lesson we learned that day: skepticism is good; because life is far more interesting and complex than our assumptions would have us believe, especially those assumptions about other people. 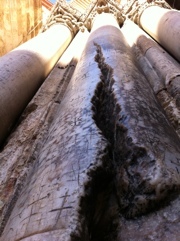 But at a deeper level, what we learned was our faith is a resource, the deepest of deep wells. It is not only a tool for coping with difficulties, but it provides some sense of both meaning and direction. That is where I’d like to address the question for this panel today. And as a way to talk about what Christianity says about peace, I’d like to do so from the side by answering this question: What is the Christian response to violence? There are typically two answers to this question from the Christian tradition that many of us would be familiar with. First, there is what is known as the “just war” theory, first developed in a Christian sense by St. Augustine in the 4th and 5th centuries. Without going into too much detail, it is the theological rationale that there is such a thing as permissible violence, but within a very clearly prescribed set of circumstances that limit behavior during war and also limit the reasons for going to war. In short, the good must outweigh the bad. Second, there is pacifism, which roots itself in Christ’s teaching to “turn the other cheek”. It had its proponents in the early church, and has continued as a Christian way of thought. We know it best in the Rev. Martin Luther King, Jr., who employed it as both a strategy and a way of life. But in both cases, what is not an option is revenge. It is not a Christian value. There is no justification, from a Christian perspective, for getting even. Instead, whether we end up as proponents of just war or pacifism, the Christian response to violence begins with repentance. Repentance means “turning to God”. It is an examination of the self, of one’s society, of one’s participation in that society. This is best illustrated by a story from Luke’s gospel. Jesus has arrived in Jerusalem and comes across a crowd talking current events. They are discussing two stories in particular: The first is the murder of Jewish worshipers by Pontius Pilate, or as the story says graphically, the “mingling of their blood with that of their sacrifices”. The second is the death of eighteen under the weight of a collapsing tower. In some ways, it is the story of both a human-caused and a natural disaster. The assumption at the time would have been that violent deaths were caused by violent lives. The worse the sinner, the worse the death. I wish this viewpoint had disappeared with history, but it was in the wake of 9/11 ten years ago that Jerry Falwell and Pat Robertson put forth the opinion that the terrorist attacks were God’s punishment for Americans’ godlessness. In that, I hear Jesus issuing a warning: lives lived without repentance – without the humility and honesty of acknowledging wrongdoing – are destined for tragedy. And not in the sense that either Falwell or Robertson might believe. Repentance is, after all, a turning to face God. It is a shining of light on that which is shrouded in darkness. It is painful, but it is restorative. Before anything else, there is the need to confront our brokenness, our imperfections, the evil we harbor within ourselves. And repentance is not confined to the individual. It is a collective responsibility. How are we complicit? How do we participate in systems which allow violence to flourish? It is my conviction that it is the asking of these difficult questions that begins the Christian path to peace. It is the moral consequences of the answers that give us direction. The interfaith panel was sponsored by Oglethorpe University’s Coexist group, featuring Christian, Jewish, Muslim, and Sikh speakers followed by thoughtful round table conversations. It so happened that, at the time he made this comment, there was a conference going on in Chicago about the painter, Warner Sallman. Sallman is famous for that face of Christ painting – you know the one: Jesus the Nordic shepherd, with the high forehead, the pointed nose, the beautiful flowing hair, the perfectly quaffed beard…If we’re honest, we know that this majestic, European fair-skinned Jesus bears little resemblance to the man who walked the road to Emmaus, but what did Jesus look like? When I was in high school, I attended a workshop at an Atlanta church. The speaker was presenting his evidence that Jesus was a dark-skinned African. The tribes of Israel had been in captivity inAfrica, Jesus and his family had sought refuge there, and in Revelation, the return of Christ is depicted as a man with “feet like burnished bronze” and hair “like white wool”. Of course, it was North Africa –Egypt to be precise – that was the Biblical place of both refuge and captivity. And the description of “wool” refers to the color, not the texture, of the hair in question. This was probably no more or less accurate an historical depiction of Jesus than Warner Sallman’s Jesus the Teuton. But what did Jesus look like? My father had his own theory. He didn’t think that Jesus looked much like a white man, or a black man. He figured that Jesus probably looked a lot like a man from the Middle East. The person he knew best that fit that description was Fahed Abu-Akel, a friend of this congregation and of mine, founder of Atlanta Ministry with International Students, former moderator of our denomination’s General Assembly. Fahed is a Palestinian Israeli-Arab from theGalilee. But rather than a head of wool or a magnificent flowing mane, Fahed – even then – had very little hair to be described poetically. Fahed looks very little like the image of Jesus we likely hold in mind; but my father’s point is well-taken. What did Jesus look like? From our gospel lesson this morning, it seems that not even the disciples knew how to answer that question. No sooner have the women found the tomb empty than two of them set off for the village of Emmaus, a town seven miles to the West of Jerusalem. The risen Christ makes a cameo, joining them as a fellow traveler; but they don’t recognize him. They talk to him about him, and they still don’t know who he is. He then explains to them how Jesus was the Messiah, explaining the Scriptures to them. And still, after close to two hours on the road together, they have no clue who this man is – and apparently they haven’t even bothered to ask his name! Finally, they get to Emmaus, and invite Jesus in for supper. And as soon as he breaks bread, their eyes are open, and they recognize him – and he vanishes. They are so astonished that, even though it is close to evening, they immediately get up and go back to Jerusalem to tell the others. What does Jesus look like? And what happens when we recognize him? If this story has anything to teach us today, it is that we recognize Jesus when we share with others. That’s the thought at the heart of our communion celebrations – that when we gather around the communion table, Jesus is in our midst. But it’s not limited to the communion table – any table where we gather in fellowship with one another, Jesus is there with us. And yet, like the disciples, we can be slow on the uptake. So often our eyes are closed to the presence of Jesus. That’s why the disciples are so wonderful. They had immediate access to Jesus for three full years. After the resurrection, they got another forty days. And even so, they still don’t get it! And yet, as our first reading reminds us, despite their many shortcomings, Jesus still puts them in charge of that early church. It hasn’t been quite two months since the events on the road to Emmaus, and as Peter addresses the crowd on the bizarre happenings of Pentecost, he becomes the face of Jesus. After all, the church is the body of Christ, right? If that’s the case, then somebody’s gotta be the face. And that’s no less true of us today as a church, some six thousand miles and some two thousand years removed from the events in our morning’s texts. We are the body of Christ. Where we go, we bring the presence of Jesus. Think about the ministries we support: our commitment to the Druid Hills Night Shelter is one example, where we go to serve men who are trying to get off the street, men whom society has pretty much given up on; we are the face of Jesus, sitting at table and breaking bread with others. Or our Food Pantry, where we live out Christ’s command to feed the hungry, but even more so, to love those whom we serve; or our Habitat for Humanity build, where we become Christ’s hands and feet, working alongside a family as they work – and work hard – to put a roof over their heads. There are so many other examples – our Bargain Shop, our Christian Education classes, our Preschool, our prayers and our acts of kindness to one another as we deliver meals and help with chores. We are the face of Jesus. What a blessing – and what a burden – in a world that is so in need of Jesus! As if we needed any reminder of that, this past week brought news of the killing of Osama bin Laden. I don’t feel any need to add to the exhaustive and exhausting commentary you’ve already heard. But I did find this one piece of information absolutely fascinating. Christians make up some 2% of the population of Pakistan. The Presbyterian church’s history there goes back to 1854, more than 150 years ago. Today, the estimate is that there are some 300 Presbyterian congregations in Pakistan, with membership of more than a quarter million. I knew some of this already. But here’s what I learned: there is an Abbottabad Presbyterian Church. In the town where bin Laden had been hiding for some six years, a city of some 300,000, there is a Presbyterian church no more than two miles from the now-famous fortified compound. Friends, we are the face of Christ. We may not live in Abbottabad, but we know that there is darkness in our own community. And it, too, is often out of site, hidden behind walls. It’s the darkness of addiction, of suicide, of abuse, of cruelty, of selfishness, of indifference to suffering, of hopelessness and despair. And even though it is a void, we are the ones who bring the hope of the gospel. We do that as a church, yes, as an institution, but we also do that as individuals. Our lives come in contact with the darkness each and every day – and into that darkness, we are invited to be bearers of light. We bring the gentle touch of encouragement, the thoughtful act of kindness, the listening ear of hope, the challenging word of selflessness and the promise of purpose. In short, there is no place that Jesus will not go, which also means that we do not go there alone. Christ is with us, walking that road, opening our eyes, feeding us. What does Jesus look like? Does he look like a Norwegian strongman, or an African warrior, or a Palestinian Israeli-Arab? Yes. What does Jesus look like? He looks like us. May we have the wisdom and the faith to be the presence of Christ wherever we go. bluntly, a slum. 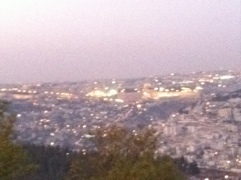 One week later, we stood on an overlook outside of Bethlehem, taken there by an Israeli security expert. Apparently not knowing our itinerary up to that point, he pointed out Deheisheh. “It’s not really a camp, though,” he said. “It’s a neighborhood just like any other.” the collective skepticism of the group went off the scale. playground with new slides, jungle gyms, and a soft green ground cover. You wonder what might happen if the kids were left to their own devices without parental infection. 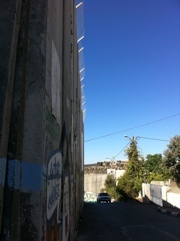 3) Walls, Walls, Everywhere the Walls: No one in the Palestinian side of the Wall took us on a tour of it. No one had to. The barbaric 30 foot tall structure practically speaks for itself. 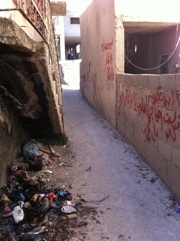 Houses are crammed up as close to the barrier as possible; open agricultural land sits empty on the other side of the wall, separated from those who own and farm it. It cuts down the middle of streets, snakes this way and that to include this Israeli settlement and exclude that Palestinian village (in the example above, though, both play areas are on the same side of the wall and governed by the same Jerusalem municipality). As our security guide described it, he called it a fence (for the record, most of its length is fence; but most of the population is confronted with the hideous concrete), and described the many humanitarian conditions built into the structure to minimize the negative impact on the civilian population, such as agricultural gates and checkpoints. The reality of these things is very different, of course, and inconveniently, perhaps, nowhere in international law can security be an excuse for impeding freedom of movement, which a basic human right. There is plenty of blame to go around in the perpetuation of the conflict. Mentalities and denials of the other, veiling either subtle indifference or outright aggression as self-defense, even the simple fact of old patterns all add fuel to a fire that needs very little stoking. As if I needed to be reminded of all this, our taxi driver on the way to the airport helped me out. It began as a pleasant enough conversation about family and home life and the like. And then, as if a switch flipped, we were suddenly on unpleasant ground. His all-too-familiar list of Palestinian grievances against Israelis suddenly kicked into overdrive, overstating the pro-Israel lobby’s power in DC, wondering outloud why the Holocaust museum focuses only on Jews, and then topping it all off with the obscene statement that “no Jew anywhere at anytime has done anything good for anybody.” All the peace movement folks we met, he said, aren’t really for peace. They’re just liars. Yes, there is plenty of toxicity to go around. And the longer that walls, both real and metaphorical, persist, the faster and further these cancers will spread. When the cognitive dissonance runs as deep as these examples show, there is a thread of the prophetic observation that people are proclaiming peace while the world is in flames. Bleak? Yes. But all the more reason for those of us willing to cross these barriers to build bridges that bypass the walls. That’s the hope and the challenge that will disturb and motivate me on the flight home. The stones of this place are amazing. The history practically leaps out of them. From the time of the patriarchs and matriarchs and prophets to the time of Jesus, and down through centuries of one Empire and nation after another, there are stones to mark each and every transfer of power. It’s an impressive city, one that inspired to the heights and depths of emotion and faith. It’s all so remarkable, all so seemingly eternal, and yet all so truly temporary. Christians through the centuries have understood this statement as his prediction of the Temple’s destruction in the year 70 when the Emperor Titus carried out the demolition as punishment for what is called the Great Jewish Revolt. And that may be true – the Temple had already been destroyed once already, when the ancient Israelite kingdom had been conquered by the Babylonians. There had been several rebellions against Roman rule already, and Jesus knew what the Romans were capable of. But I think that there’s a more permanent meaning to this observation. Layer after layer of history fills this place. Politics often works to prioritize one layer over another, but the one enduring truth is that every layer has been followed by another. That is no less true of the present as it was in the past. That’s not an excuse for inaction, a justification for passivity, simply because injustice and evil are the one thing that seem to be consistent. Instead, it should be the very encouragement we need to build something more permanent. As a Christian, I call it by the name of the kingdom of God. But unlike any earthly kingdom, unlike a theocracy, this building is made of living stones, the people of this place so full of horror and wonder. We have spent ten days as a group building those relationships with each other. I hope that we have also done the same with the many people with whom we’ve come in contact. Working for an end to the Israeli-Palestinian conflict is a noble goal. Endeavoring to end Occupation and terror and to tear down walls is a righteous enterprise. But this is only a start; it is only the strength of living stones knit together that can bring about the peaceable kingdom. 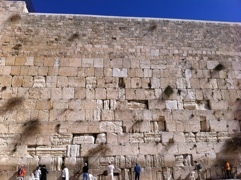 One thing is certain: these walls of dead stone will come down. A long time ago, a man named David brought a sacred object to a town named Jerusalem, placing it on a mountain as a way to enhance the spiritual identity of the Jewish people. If you identified this as a Biblical story, you’re half-right. King David did, indeed, place the Ark of the Covenant at Mount Moriah in Jerusalem of the Jebusites to establish the new capital of his kingdom and unify the Jewish people. In 1949, another event shares echoes of this story. 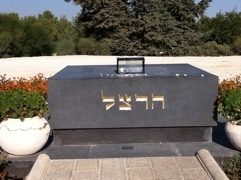 David Ben-Gurion, President of the new State of Israel, brought the remains of Theodore Herzl (founder of modern, political Zionism) to a mountain in the new Jerusalem (soon to be called Mt. Herzl), so that the Jewish people could be united around a new secularly sacred site. Our time in Israel and Palestine has been engaging a number of stories and and narratives. We have certainly privileged the Christian stories, both modern and ancient. But you cannot come here without engaging the political, cultural, and religious narratives of Israelis and Palestinians alike. And as we spend time with the Israeli Jewish cultural identity, there is no better place to do this than Mt. Herzl. I’m very aware of how much of a parallel there is between the Israeli civil religion and the American version. Benjamin Franklin, in the early days of the new republic, reflected on how these new Americans could have allegiance to a transcendent idea when there would be separation of church and state. As a good deist, he identified several characteristics to which he thought all religions could ascribe. It was around these ideas that the American civil religion took root and grew. It has its own rituals, like the changing of the guard at the tomb of the unknown soldier (for more on this topic, read Robert Bellah). There are many parallels between how the two nation’s civil religions have unfolded, including conflict with and exclusion of indigenous people, as well as a religious vision being a part if its establishment. And since then, the lofty ideals of these nations have remained as reminders of how far they still have to go (and have left some waiting for injustices to be redressed). It is hard to stand in this city and not weep for what might have been or what yet might be. There is something central about the reality of Jesus as the embodiment of the divine. Christians absurdly believe in the story that the one who created it all is most fully revealed to us in a first century man named Jesus; and that same Jesus tasted, quite literally, the utter humiliations that humanity faces. It is in the echoes of that, hopefully, that most Christian ministry takes place. And ad we’ve been traveling through the regions, this vision of incarnation, of Godly enfleshment, has been one of our anchors. 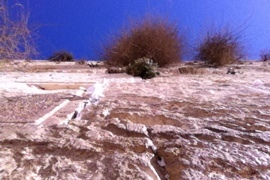 Walking in the footsteps of Jesus, we have been reminded of the physicality of the Biblical stories. As we have met and worshiped with Christian communities, we have engaged the living stones and have, I hope, represented the body of Christ well. Everywhere we have been, we have been reminded of the story where Philip invites Nathanael to meet the Messiah. Nathanael is very skeptical. Rather than argue with him, though, Philip simply says, “Come and see.” In other words, don’t take my word for it. Go and check it out for yourself. We have been following in these footsteps of Nathanael. It is not necessary to buy into one narrative or another in this region. The best thing to do is to come and see for yourselves. Walk the Emmaus Road; you will most certainly be joined by the presence of the living Lord. 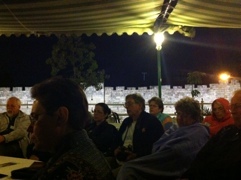 One ministry we heard about was the Ecumenical Accompaniment Program in Palestine and Israel. A project of the World Council of Churches, EAPPI is a manifestation of bringing the presence of Christ to places of great anguish. Checkpoints, places where the Wall/Barrier/Fence is evicting people, anywhere that people can be helped by the presence of internationals, showing care for the local Christian communities, all of these are ways in which the EAPPI accompanies people in dire need. There are so many ways in which the connective tissue of the body of Christ becomes real. Don’t believe me? Come and see for yourself.